Congressman’s office yields nearly 6,000 pages of VA data about radiation dump under Brentwood School and dog park. EnviroReporter.com and Los Angeles CityBeat are analyzing this treasure trove of dump docs held by Waxman’s office since mid-December 2006. 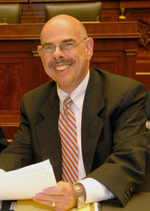 Waxman staff informed EnviroReporter.com first of the release on August 8, 2007. Outgoing VA Secretary Nicholson asks Waxman to remove draft report citing rad waste under Brentwood School from Rep’s website– Waxman says no and signals interest in unraveling mysteries of VA nuke dump. Second Phase of VA nuke dump testing in limbo even though Secretary Nicholson promised Congressman of progress last December. Long-awaited CARES meeting September 5, 2007 may decide fate of VA.